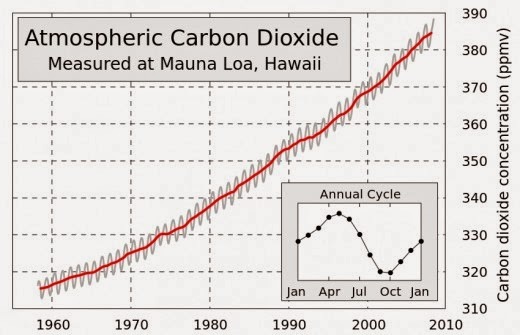 The Reality of Climate Change: Charts of atmospheric CO2 from 1960 to 2010. This is a departure from our usual prepper posts, but if nothing else, the reality of climate change should encourage more people to get prepared for shortages and uncertainty. Think about this - there is already a huge list of cities past nuisance flooding levels. It is likely that the next decades will be ones of unpredictable weather. That means an increased risk of power outages, flooding, and other hazards. While it's not quite time to build a raft, it is time to stock up. If Climate Change is Really Happening, Why Are Some Places Really Cold? You have to understand what scientists mean when they say that average temperatures are increasing. That means an average of temperatures all over the world. Just because one place has abnormally cold weather one winter, it does not mean that is not balanced out by places with unusually hot summers or warm winters. Also, global warming is causing both poles to lose ice rapidly. As this ice breaks off, it travels into the ocean's global currents and changes the currents. That means that some areas will actually experience colder temperatures than might be expected because of the colder currents in the sea.